It was a chance to go back to the Manila North Cemetery. After getting reprimanded for taking pictures without getting a permit last time, I was eager to have not just a reason to go back, but to take photos as well. We were there for the 110th anniversary of the arrival of the Thomasites in the Philippines. 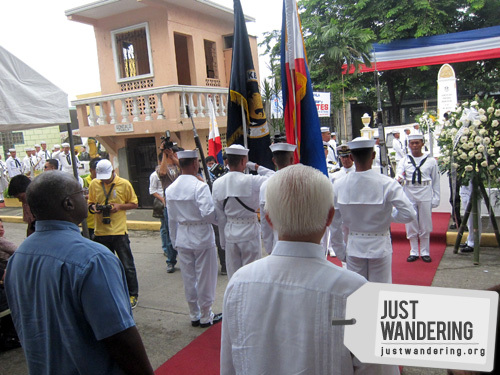 Hosted by the City of Manila, the ceremony was a solemn affair headed by the men and women of the Philippine Navy. Flowers were offered on the graves by students of the Ramon Magsaysay College, members of the National Historical Commission, Manila Historial and Heritage Commission and Department of Education, as well as Manila Mayor Alfredo Lim and US Ambassador to the Philippines, Harry J.Thomas. The commemoration was capped with a three volley salute, which took everybody by surprise. Event details aside, it was great to be back in the North Cemetery. As the taxi was making its way to the Thomasite’s plot, my eyes were hungrily taking in all the details of the mausoleums we pass by, mentally noting their location for future visits. 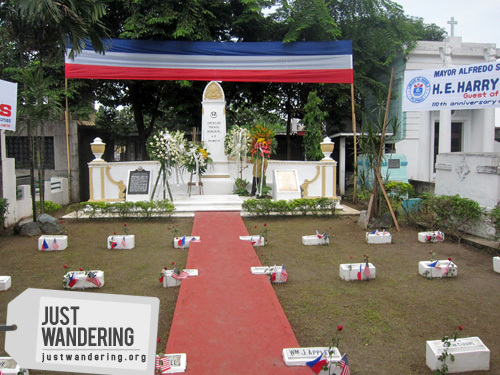 The Manila North Cemetery is the final resting place of many notable Filipinos. Not only that, many of the tombs and mausoleums have very interesting architecture and detail. While these are scattered all over the sprawling 54 hectare land, a walk down Main Avenue is enough to whet your curiosity if you’re pressed for time. The first to catch your notice would be the Roxas family plot, which is in the rotunda. Buried here are Former President Manuel A. Roxas, his son Gerardo Roxas, Sr. and grandson Gerardo Roxas, Jr. Boxing champion Pancho Villa and composer Manuel Velarde, Jr. are also buried in Main Avenue. Aside from the Thomasites, there are other group plots on Main Avenue like the Armed Forces of the Philippines cemetery and the Masonic burial grounds. 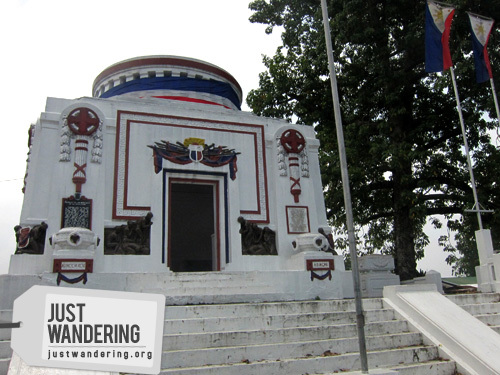 The big find for us that morning though was the Mousoleo de los Veteranos de la Revolución (Mausoleum for the Revolution Veterans), which we stumbled upon by accident. It was in an alley off Main Avenue, an imposing structure that rises up above the other graves. Here lies the remains of the men who fought during the Philippine revolution in 1896 to 1901. That was as far as we were able to explore since we had to rush off. I’m itching to go back (yet again) to take my time exploring the cemetery. Kakaiba ito Nina – the cemetery as a must-visit. Don’t even know where this is. But based on your enthusiastic description, it’s worth a visit. A lot of our history is buried there pala. i’ve heard madami ngang mga interesting structures dyan… too bad I’ve haven’t visited it yet… maybe soon! Okay dun! Basta be sure to register sa entrance lang kasi hindi sila comfortable na may mga pagala gala na mga tao dun. ma-try nga rin pumunta dyan one time. I heard nga na magaganda daw talaga ang mga mausoleums. Sana lang may sumama sakin kasi ayokong mag-isang maglakad sa sementeryo. wow,di ko alam na may historical part yang cemetery na yan.iba kasi napapanood ko sa tv. Why would you need a permit? That’s weird! There are a lot of people living in the cemetery and they’re probably concerned that something might happen.